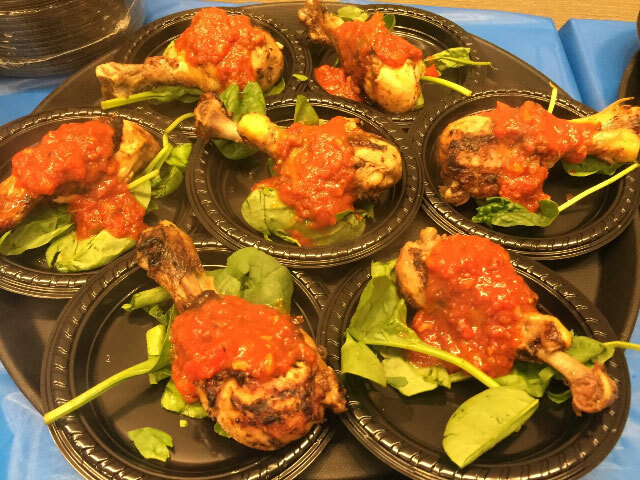 Pittsburgh, PA, August 7, 2015: During the Pittsburgh Restaurant Week Kickoff Party at the National Aviary sixteen restaurants participating in Pittsburgh Restaurant Week Summer 2015 provided passed samplings to a crowd of 250 foodies. With hopes of luring customers to their restaurant for restaurant week, restaurants also competed for the #BESTPREVIEW PRABBY (Pittsburgh Restaurant Awarded Best By Yinz) award. The restaurants which competed for #BESTPREVIEW included Asiago’s Tuscan Italian Restaurant, Atria’s, Benjamin’s Western Avenue Burger Bar, Bigham Tavern, Bill’s Bar and Burger, Butcher and the Rye, Istanbul Sofra, Kaleidoscope Café, Lidia’s Pittsburgh, Matteo’s, Meat & Potatoes, täkō, The Carlton, The Tuscan Inn and The Wooden Nickel. With every restaurant receiving votes from the party guests, the #BESTPREVIEW honor goes to first-time participant, Pan Asian Kitchen in Lawrenceville. Pan offered two preview bites pictured below. During Pittsburgh Restaurant Week, Pan is offering a $20.15 Specialty of a craft roll and bowl. The Lobster Monkey Roll of house lobster salad, tempura banana, avacado and smoked habanero-mango puree. Kuro Buta Belly, a sichuan braised pork belly, Japanese yam, carrot & ginger puree. Istanbul Sofra, Asiago’s Tuscan Italian and Matteo’s also earned high honors in the voting from the guests. Online voting continutes for the #MostMouthwatering award category at vote.pghrw.co or vote.pittsburghrestaurantweek.com/pghrestaurantwk.